One of the most popular parts of the NIU gameday experience will see a shift designed to better align it with its key audiences. 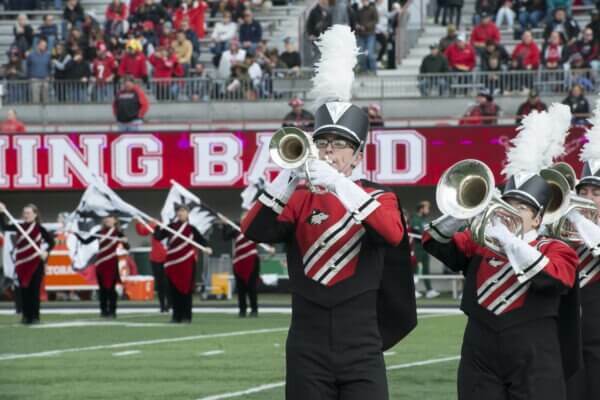 Starting next fall, as part of a coordinated effort between university administration, the College of Visual and Performing Arts and the Athletic Department, the Huskie Marching Band will be relocated, administratively but not physically, from CVPA to athletics. A natural correlation already exists as the vast majority of the band’s appearances and performances are directly related to supporting athletics events. For members of the band, not much will change. The marching band office, practice areas and equipment storage will remain in the Music Building. Band members will still be enrolled in a one credit music class and the band will continue to be directed by School of Music faculty member Tom Bough. The move from CVPA to athletics is reflective of the academic makeup of the Huskie Marching Band. Bough said that year after year about 85 percent of band members are non-music majors. The band is currently made up of 147 musicians, 25 colorguard and 16 Silverette Dance Line members. Recent initiatives to increase the size of the band will continue in an effort to assist with attendance, fan experience, alumni engagement and student enrollment.